Welcome dear visitor, The Fasoulakis family invites you to spend your vacation with them in their small, family-owned 3 star hotel for a friendly and sociable holiday away from mass tourism. Valley Village Hotel is a paradise for families, couples and independent travelers. We speak English , German and French and we are happy to welcome guests from all over the world. There are a great number of regular guests who visit us every year and feels very comfortable being here at our house. Our team: The three brothers: Kostas is the oldests and he is the director, Dimitris and Giorgos are doing the reception the bar and the service in the hotel, Alici is the wife of Kostas and she is responsible of our kitchen with the supervisor of Mother Katerina , and the young Katerina is the daughter of Kostas and Aliki she is 5 and always a good partner for playing with guests kids. The father Manolis is responsible for the garden and the plantations of the family. Our wonderfully green and well-preserved garden of 6 acres, surrounds Valley Village complex with its two swimming pools, a playground, volley ball court and an outdoor bar. There are two swimming pools with fresh sweet water one for adults and a separate childrens pool. Each of the Family bungalows have their own private entrance through the garden , terrace, balcony with views to the pool, two bedrooms,shower/bath /wc; direct dial telephone; radio; fridge and remote controlled air conditioning. They are ideal to accommodate families of up to 4 or 5 Persons. Also Double rooms are available with the same facilities as the bungalows with a choice of double or twin beds. And they can accommodate up to 3 Persons. A large open terrace around the pools with sun loungers -free of charge. You can relax under the shade of our pergolas and the trees around the pool area. The use of the pool is allowed until late in the evening. In the reception area you can find our lively hotel bar with its verandas. The restaurant with its terrace, satellite tv-corner with fast, efficient and discreet Internet facilities is available should you feel the need to be in touch with people back home. Breakfast consists of filter coffee, tea or hot chocolate, orange and grape juice, bread, butter, jam, cheese, ham, eggs, home made cake, yogurt with honey, corn flakes or muesli, tomatoes, olives ,feta cheese, fresh fruit and is served in a buffet style between 8am and 10am. Evening meal is also served in a buffet Style between 7pm and 9pm. 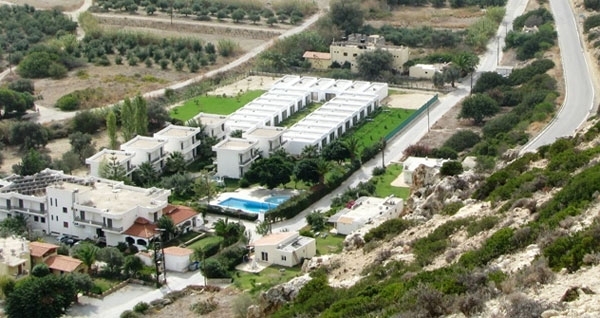 The Matala Valley village is located only 800metres from Matala beach. Valley Village consists of family size bungalows and double rooms able to accommodate more than 90 guests. experience our selection of traditional home made greek specialties. Our food is prepared fresh with care from our family using many of our home grown organic products. Such as olive oil, olives, grapes, wine, raki oranges and orange juices from our own production. Also the wine, the raki and the oranges come from our fields. In the hot summer days our guests can enjoy their breakfast or dinner at the terrace with view to the garden or to the pool. With participation of the family and the guests (no professional dancers) once a week there is a Greek Evening with barbeque in the garden, live music, syrtaki dance, house wine and lots of fun, or open parties with professional D.J. at the garden and pool of the hotel in the hot summer nights. Join us in the kitchen and see, smell and taste what will be served for your dinner. Learn how to make stuffed tomatoes, tzatziki and Cretan small cheese pies. Get the recipes and impress your friends at home! Take home a bottle of the family olive oil to remind you of us every time you sprinkle your salad. A visit to our plantation- pick oranges for the hotel. Visit our olive groves and vineyard and participate in the harvesting of the grapes and making wine in September. Also experience how to make home made Raki in October..